We are certain that you will enjoy your birds more than ever with the advantages offered by our Custom Log Birdhouses when properly mounted in the right place. Bird houses should be 20-50 feet from your house or a bit nearer if you have a quiet place sheltered from noise and traffic. Bluebird houses should be spaced at least a hundred feet apart. Bluebirds will usually tolerate other species within 20-30 feel. Open shade or sunlight with short-grass area is ideal for bluebirds. (Shade in the hottest part of the day.) Chickadees and Tufted Titmice prefer wooded areas. Clean out the nest after each brood leaves. Face the house with entrance hole any direction away from prevailing strong winds. Box filled with unorganized twigs. Eggs pierced and/or on ground below box, leaving nest undisturbed. Nestlings pecked on head or dead on ground below box, nest undisturbed. Mount wren box with 1-inch hole near shrubbery. 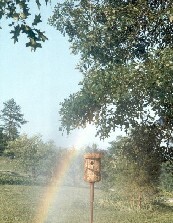 Move bluebird box 100 feet away from shrubs, trees. Leave completed wren nests alone, and erect another box in the open for bluebirds. Box filled with straw, trash, feathers, curving up back of box. Eggs missing or on ground below box, nest undisturbed. 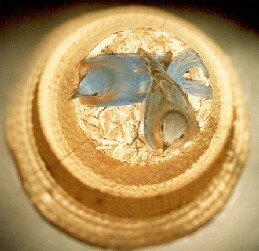 Adult bluebird dead on nest, head pecked. Allow bird to build, then trap by plugging hole. If this fails, use trap in box or cage trap baited with corn. Don't mount boxes near barns where animals are fed; don't deed corn. If sparrows outnumber bluebirds, accept defeat and remove boxes. Feathers, often white, on top of nest. Rarely, eggs missing or young pecked, nest undisturbed. Erect another box 15-25 feet away. Tree swallows are to be welcomed as nesters, will help defend bluebirds from wrens, sparrows, other swallows. Female bluebird, eggs or young gone; nest pulled out of hole, feathers on ground under box. Scratch marks on box. Clean box and remount on metal pole fitted with predator baffle. Mount in open area, far from cover. All eggs or young gone, nest undisturbed, no scratch marks or remains left. Remove nest. Remount box on pole fitted with stovepipe predator baffle. One or more eggs or young missing, nest undisturbed, no scratch marks or remains left. Adults flutter at box hole but don't go in; nest may be abandoned though pair seen in the area. Check inside ceiling of box for wasp nest. Crush nest and insects with long stick (wait until dark if insects are aggressive.) Rub bar or liquid soap on box ceiling to repel. Do not use insecticides in box. Remove broken eggs or dead young. Replace nesting material if young are threatened. Apply a band of grease, oil, or Teflon spray to pole. Nestlings weak and slow to develop, heads and wings scabby. Maggots may be attached under wings. Dirty, ill-smelling damp layer under nest cup. Brown pupal capsules in bottom of box. Use putty knife to check under nest cup. Remove and confine nestlings, remove nest, clean box. Pack fresh dry grass tightly in box and replace nestlings. Do not use insecticide in box. Do not attempt blowfly control after nestlings are 13 days old. Nestlings dead or chilled in wet nest. Watch boxes closely in cold, wet weather. Fill vent holes with putty-type weather stripping. Replace wet nest with clean dry grass. Remove dead nestlings and warm living ones before replacing in dry nest. Supplement food with mealworms, conspicuously placed on or near box. Apparently healthy nestlings found dead, unmarked but bloated, often about 8 days old, parents in attendance. Parent disappears without signs of predation. Birds found dying with tremors, disorientation. Investigate surroundings for brown, withered vegetation (herbicide) or signs of pesticide us. Try to arrange a moratorium on spraying. Relocate box if unsuccessful.